My kids love Chicken Clagiving night. That’s what they named our version of not Thanksgiving – with Roasted Chicken, Gravy, Homemade Stuffing, and Mashed Potatoes. The key to stuffing (or croutons if you’re making those), is to have your bread thoroughly dried out. This is almost never a problem for me since I’m inclined to buy bread, but then forget about it and leave it on the counter. If you had to grocery same day, don’t fret – just cube bread and bake dry in the oven. 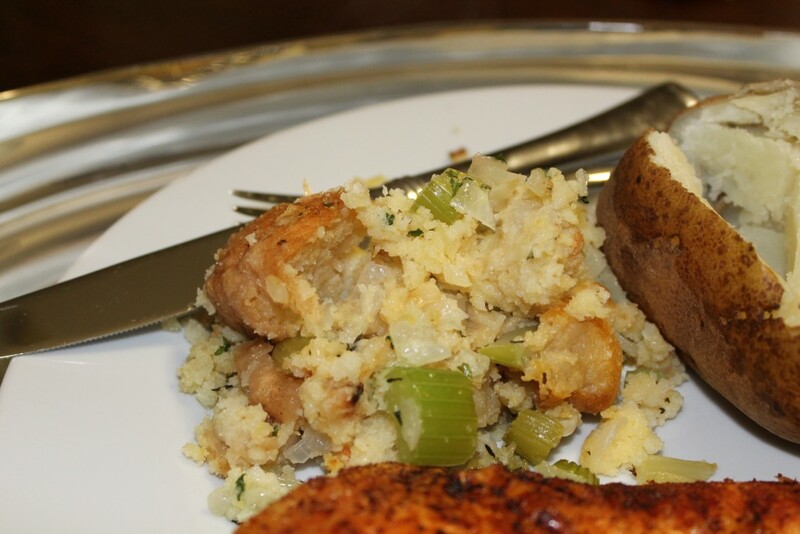 Stuffing, aka dressing, is very forgiving and you can you can adjust your liquids and vegetables. My mother likes to add chopped Hard Boiled Egg, and I saw a Louisiana recipe the other day that included green olives and almonds. Just don’t forget the Gravy. Preheat oven to 375. Cube ciabatta and cornbread to approx 1 inch cubes. You want these to be dried out, so if either is too soft, spread on a cookie sheet and dry bake at 300 for 6-8 minutes. Butter a glass 9 x 13 inch pan. Spread bread cubes evenly in buttered casserole dish. In a heavy bottomed saute pan, melt butter. Saute celery and onions for 6 minutes. Pour this buttered vegetable mixture over bread cubes. Pour chicken stock over then sprinkle seasonings evenly across the top. Stir with a wooden spatula to combine. Pour melted butter over the top of stuffing. Bake stuffing for 35 minutes. This is the Chocolate Bottom Crusted Chocolate Pie I made for Julia, a friend of my daughter, when her grandfather passed away. Hers had meringue on top, but I’m a big fan of real whipped cream over meringue, any day. For years, every time I saw Julia, we talked about this pie. It was the first and only chocolate pie, I’d ever made, and it took me several years to remember anything other than making meringue in cold, wet weather is a whip, and one I’d rather not experience again. 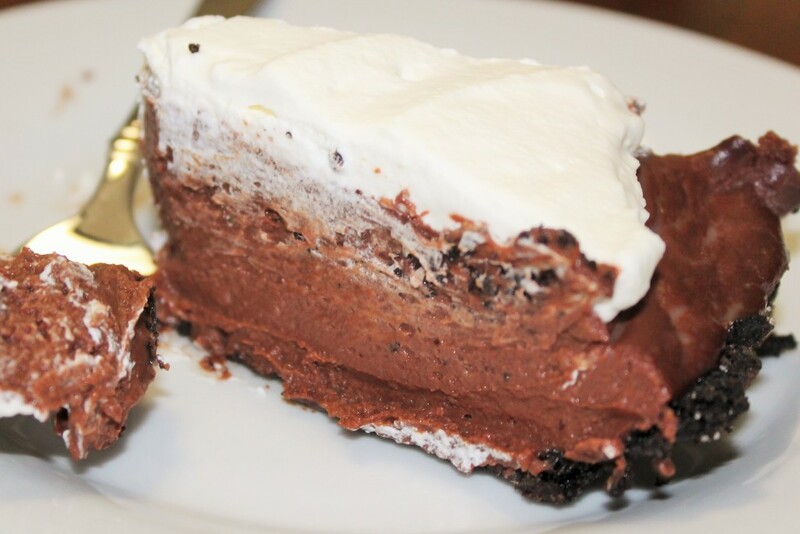 I decided we should bring back this much discussed chocolate pie recipe, so I served it at Christmas. It was gobbled up so quickly, I failed to photograph a slice. As a result, I was forced to make another for our Bowl Game ; ). Good thing the pie was there to dry our tears. Let’s here it for a better year of Texas Football in 2015. Preheat oven to 350. In a food processor, crush cookies to crumbs. Pour into a glass pie pan. Top with melted butter and sugar, then use a spatula to mix. When combined, use your fingers to evenly cover bottom and sides of pie pan. Bake for 15 minutes, then set aside. In a large heavy bottom sauce pan, combine sugar, cornstarch, salt and egg yolks with a wire whisk. Turn heat to medium high, and add milk and cream mixture slowly while whisking being sure to scrape all the bottom and sides. Bring to a boil, then reduce heat, and cook for another 2 minutes. Mixture will be very thick. Remove from heat, pour through a thin mesh strainer into a clean bowl. Melt chocolate in the microwave, one minute and 30 seconds at 50% power in a glass bowl. Stir then repeat process if chocolate needs additional melt time. Add melted chocolate and softened butter to pie filling, whisk to combine. Add vanilla, whisk again. Butter wax paper, then cover surface of filling. Set aside to cool 1-2 hours depending on how wide your bowl is for cooling. When completely cool, spread into prepared pie crust and refrigerate – can be prepared a day ahead! Whip cream in a stand mixer to fluffy, then add powdered sugar. Top pie with whipped cream. Winter is here, and with it comes my favorite, soup season. Second only to cooking with cognac season. The best soups start with bones, so as you bake those holiday hams, chickens, and turkeys – be planning your best soups yet! Beans are another food group I didn’t consume until at least 25, so in a way, I’m still easing my way into legumes. I use navy beans because they are small and extremely mild. 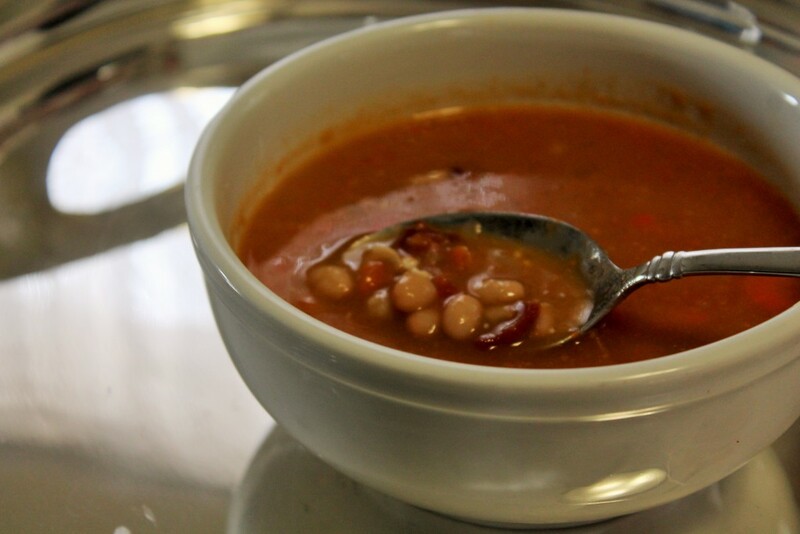 If you want a more robust white bean flavor, you can try Great Northern or Cannellini. The bacon crumble topping is a game changer in terms of texture and flavor. You could also top with fresh chives, scallions, queso fresco, or crostini. Cover your ham bone completely with water. Bring to a boil, then reduce heat to the lowest setting. Cook as long as you possibly can. This round I did for probably six hours. Every 2 hours check to see if you need to add any water to combat evaporation. In a pinch, an hour and a half will still create a really nice soup base, the flavor just grows exponentially with time. Use a slotted spoon to remove large bones, then strain soup base through a strainer and set aside. Heat a large, heavy bottomed sauce pan over medium high heat. Using kitchen shears, snip bacon into small pieces about 3/4 to an inch in width. Stir with a wooden spatula to brown. Watch heat and lower as needed to prevent over browning. Use a slotted spoon to remove bacon crumbles to a paper towel. Drain most of the bacon grease from your sauce pan. Add onion and carrots, saute over medium high heat for 5 minutes. Add garlic, saute another 2 minutes. Pour 6 cups of soup base into pan. Add tomato paste, and whisk until dissolved. Add three shakes of cayenne pepper. Bring to a boil, then reduce heat to lowest setting and simmer for 45 minutes. Using a ladle, remove 5 large ladles of bean mixture, and reserve. Use an immersion blender, or work in small batches in a food processor or blender, to cream your soup. Add back the reserved whole bean mixture. Season with kosher salt and fresh ground pepper. The amount of salt required will depend on the saltiness of your ham bone. It may could require none at all, just start slowly and cautiously when adjusting seasonings. Serve topped with bacon pieces and with crusty bread. 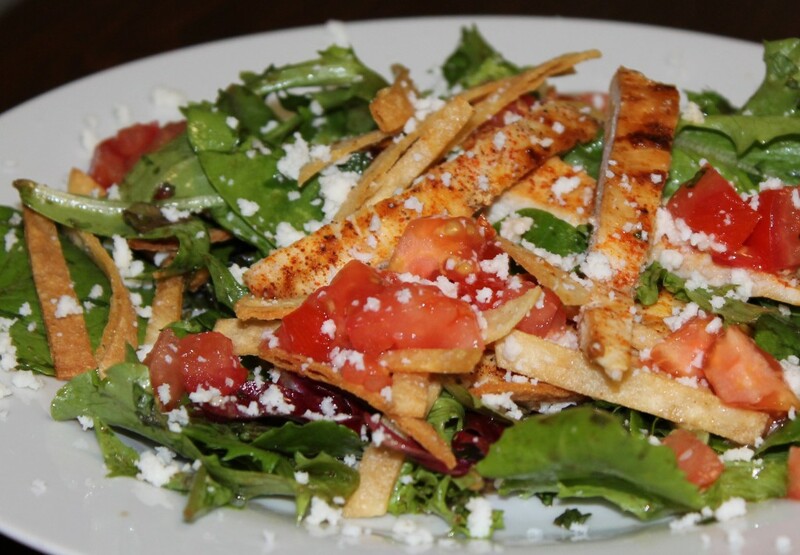 This grilled chicken salad was inspired by my favorite salad at La Duni Restaurant, the Pollo Asado a la Menta Limon. I forgot about the onions on the side and the guacamole, both of which are superb additions. I think La Duni puts the mint in the salad dressing, but I minced it and mixed it with my salad greens. The lemon brightens the balsamic and adds a fresh element to the taste. Make sure you smell your lemons before purchase, there have been so many sub-par lemons this year! A perfect lemon should smell crisp and neutral. A lemon past its prime will have a cloying scent. When cooking chicken, my 2 most essential tips are 1) let the chicken rest out of the fridge anywhere from 30 min to an hour before cooking if you can and 2) let the chicken rest again at least 15 minutes after cooking before cutting to let the juices redistribute. A grill pan is fabulous option, but if you don’t have one, a skillet will work. 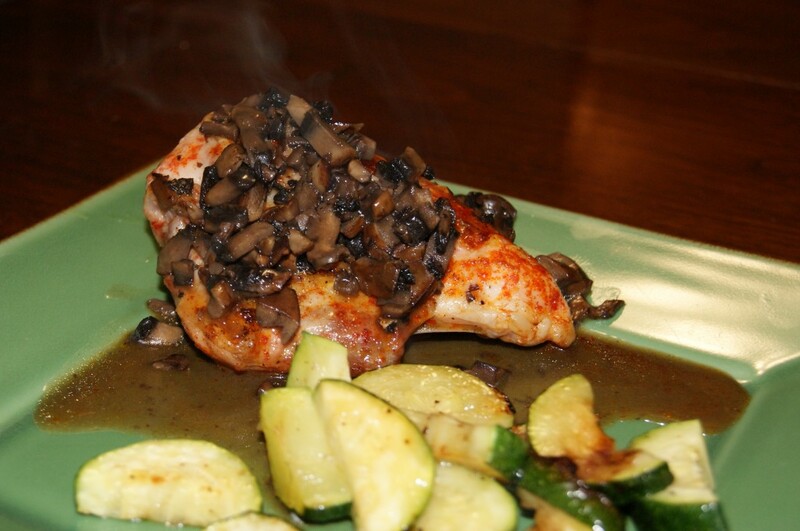 Always preheat your pan dry, then add any oil to warm, place chicken, then LEAVE IT ALONE! Chicken will turn without any sticking once it is ready, try to turn to early, that’s when chicken will stick to your pan. Cut corn tortillas into very thin strips, then in half. Heat canola oil to 375 degrees, then fry in small batches removing using a slotted spoon. Let rest on a plate covered in paper towels and salt immediately. In a small bowl or glass measuring cup, combine lemon juice, balsamic, olive oil, garlic, onion, mustard, and salt. Whisk dressing to combine, then set aside. Pound chicken breasts with a kitchen mallet to thin. Season with an even sprinkling of kosher salt, fresh ground pepper, and paprika. If you have time – let rest out of the fridge for 30 min to 1 hour before grilling. Heat a grill pan over medium high heat. Add a few swirls of olive oil and turn grill pan to coat surface. Place chicken on heated grill pan. Cook until all edges are opaque, then flip. If chicken sticks to pan at all, it is not ready to flip. Cook an additional 3-4 minutes on second side depending on thickness. Move to a cutting board to rest. Dice tomatoes and lightly salt. In a large bowl, combine mixed salad greens, mint, and tomatoes. Slice chicken into very thin strips, then add to salad greens. Pour dressing over, then toss with tongs. Plate salad, then top with tortilla strips. Use a fork to top each salad with queso fresco. 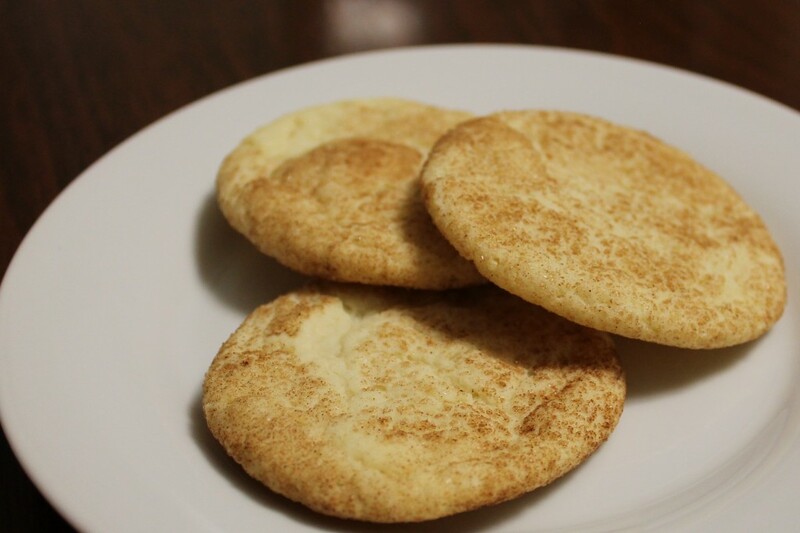 This Snickerdoodle Cookie Recipe is the most requested cookie recipe from my husband and children. It’s taken some adjusting over the years, but the end result is perfect. My personal three cardinal rules of baking apply. They are: 1) For any baked goods, use White Lily Flour. 2) Always, always completely preheat your oven. and 3) Be patient and start with a small 1 cookie sheet test run to ensure your timing and oven temperature is accurate. Baking can be affected by anything – the weather, your ingredient quality, your ingredient temperature, your mix speed, straight on down to your mood. I mean that seriously. I really believe food is sewn with the love and patience you put into it. The White Lily All-Purpose flour is a low protein, low gluten flour made from soft winter wheat making it ideal for soft and chewy baked goods like these snickerdoodles – think cookies, cakes, pumpkin/zucchini/banana whatever quickbread, muffins, etc. I promise it makes an enormous difference. You don’t want to use this type of flour for everything as it is not ideal for the breading on the outside of your turkey scallopini – for that I would stick to a standard All-Purpose. If you’re making bread or and want that harder, crusty experience – then you have to go all the way to the the high protein bread flours. It can be tricky to find, but it’s worth it. If you’re in Dallas, I have had great luck with either Central Market or the Tom Thumb at University and Inwood. If you’re either living (lucky you!) or vacationing in the Florida Panhandle, I find all Publix stores in the Destin/30A arena to carry this. I often buy extra and bring some home. Preheating your oven is critical. If you’ve ever burned the bottom only of your cookies, it was likely a preheating issue. The heat comes from the bottom and then rises to even out. Give yourself plenty of time to get to the proper temperature when baking. A roasted chicken can be forgiving, but I assure you a snickerdoodle can not. Preheat oven to 350 degrees. In your stand mixer, combine butter, sugar, eggs and vanilla, then mix to combine until light and fluffy. In a separate bowl, combine flour (note* I think the White Lily is very important for baking), cream of tartar, baking soda, and salt. Use a whisk to combine. Set stand mixer to lowest mix setting, then add your dry ingredients to your wet slowly. Do not over mix, just until they are combined! Place a cookie sheet and mixed dough into freezer to chill for about 10 minutes. In a small bowl, combine the sugar and cinnamon and whisk to combine. Remove dough and cookie sheet from freezer. Cover cookie sheet in parchment paper. Use a spoon to scoop a small amount of dough from your bowl, then use your hands to roll it into a 1 inch ball. These will spread into a perfect round shape, so don’t place them together. I use a half sheet pan (18 x 13) and I only put 8 cookies per sheet. Alternate rows of evenly spaced cookies, 2 cookies, then 1, then 2, then 1, then 2. Put your dough and another cookie sheet back in the freezer. Place cookies in the oven and bake for 11 minutes. When the cookies are perfect, they will look puffed and rounded on top but will settle down to a flat circle as they cool. If they are still wet looking when you pull them out, cook another minute and adjust, but note they will look just barely solid when they are perfect. Cool 2 minutes on cookie sheet, then move immediately to a drying rack. I have successfully mastered two sheets of cookies in the oven at one time, but be sure to switch the bottom and top racks at 6 minutes in to ensure even cooking for both. Cherry Pie reminds me of Lums Diner in Peoria, hot tea, good friends, and deep conversation. Back in my high school days, my crowd and I would congregate at the the Lums Diner, as years of soul searching, bored, but generally well behaved teenagers had done before us. This wasn’t your wild crowd, it was filled with quiet rebels. The kind that might get a little crazy discussing a classic novel or simple existential angst over an endless pot of tea or coffee and maybe sit in the smoking section. Gasp. The horror. Anyhow, one of my favorite Lums menu items of choice was warm cherry pie. It was a time of dear friends, endless conversations, and that first taste of independence that is adolescence. In a food processor, combine flour and salt. Add butter and shortening cut into little pieces. Use the pulse button to cut butter and shortening into flour until you see no more large pieces. Through the top, pour the water 1 tablespoon at a time and continue to pulse until dough is just moist. Move to a floured surface and form a ball. Divide into two equal sections. Wrap in waxed paper and chill at least 30 minutes. Roll out one with a floured rolling pin into a circle. Press into the bottom of a glass pie pan, evening out and smoothing the edge. Roll the other into a circle, then using a sharp knife, cut into 1 inch wide sections to start your lattice. In a saucepan over medium heat, combine sugar, cherries and juice. In the reserved 1/4 c. of juice, dissolve the cornstarch with a fork. Add cornstarch mixture and heat until bubbling, then simmer 5 min, stirring occasionally with a wooden spatula being sure to scrape the bottom. Add lemon juice, vanilla extract, and almond extract and remove from heat. Preheat oven to 375. 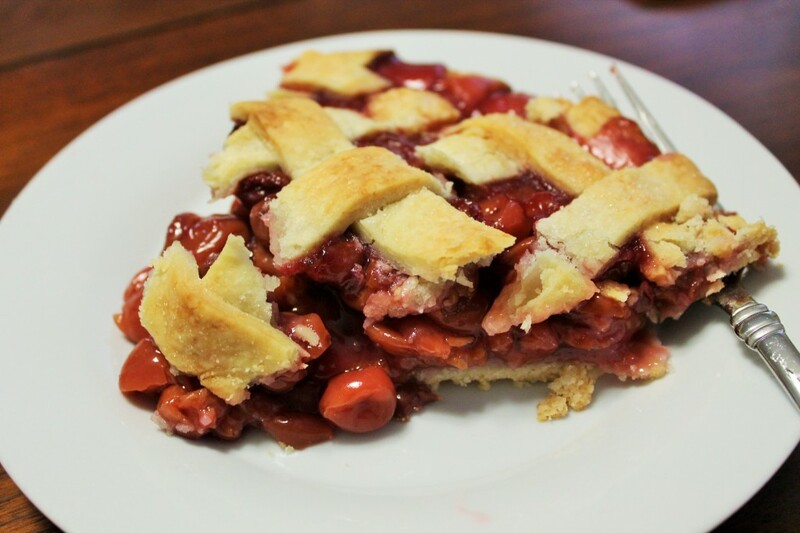 Pour thickened cherry mixture into prepared pie crust. Use small butter pieces to dot the surface evenly. For the lattice, start on the left side and lay down three of your smaller strips vertically with a 3/4″ gap in between. I like to use 1 piece in from the edge of your circle, skip a piece for the horizontal side, then choose the second strip for your 2nd vertical, skip, then the 3rd piece for your third vertical. Continue all the way across with your vertical strips. Moving back to the strips, skip that outermost edge again and grab your next strip for your first horizontal lattice. I like to start at the top. Start on top of your first vertical, then lift the second vertical from bottom of pie pan to lace underneath. Place on top the third, lace under the fourth, to the edge. Start your second horizontal, and reverse the pattern. Start underneath the first vertical this time, then lift from the bottom to lattice, then over, then under, repeat. Don’t get discouraged! Be patient, this are your hardest two rows coming up, after that it’s smooth sailing. Repeat the pattern until you complete the pie. Dust the top with a spoonful of sugar and and place in oven over a cookie sheet or a piece of aluminum foil to catch drips. Bake an hour, watching crust to keep from browning too much. If it starts to look to brown on the edges, ring in foil and continue baking. Bake until bubbly and golden. No picture sadly, but I’ve missed writing recipes. I have a backlog of photos without recipes written down and recipes without photos. At this point I find I’m killing myself with wasted time, trying to remember how I came up with that delicious dish 3 months ago. So while it may not be pretty, the blog is back with it’s original purpose in hand – to serve as my mental diary of things I’d like to cook again and felt were worth writing down. Cheers. Preheat your oven to 425. Spread chopped tomatoes over a large baking sheet and drizzle with olive oil, kosher salt, and pepper. Roast in oven for 25 minutes. Heat a 8 quart stock pot to medium high heat. Add 2 tbsp butter plus 1 tbsp olive oil. Heat until fragrant, then add celery, carrots, and onions, lightly sprinkle with kosher salt and fresh ground pepper. Heat until soft over medium high heat, reducing after about 5 minutes to prevent burning. Stirring occasionally, cook until soft, about 12 minutes total. Add chopped garlic and cook another 2 minutes. Sprinkle the flour over the vegetables and stir to cook for another 2 minutes. Add now roasted chopped tomatoes, chicken stock, and bay leaves. Bring to a boil, then simmer for 25 minutes. If you have an immersion blender, lucky you! I’m hoping for one for Christmas. Use it now to puree your soup. If not, work in small batches in your blender or Cuisinart/Food Processor to puree. I find three batches necessary and a clean pot for the pureed results. When fully pureed, add heavy cream, simmer another 5 minutes, then season with salt and pepper to taste. If you are suffering from boredom and inertia in your weekday meals, I have found the perfect recipe for you to add into your repertoire. Since the arrival of our third child, sweet Baby Hiatt, my time in the kitchen has been fractioned. I see glimpses of the future where I will gain a little of that time back. Reality for the moment means I am severely limited in time, energy, and creativity. I realize Sweet Baby Hiatt (SBH), has passed the year and a half mark and is no longer a baby at all. That said, I forgot how intensely one is required to watch daredevil, strong, pixie-like toddlers. As my friend Sarah says, I’m neck deep in the “Don’t Blink” phase. I think I have made this recipe every other week or at least every three weeks for more than the last year. Maybe not a million, but it saved us a bunch of pizza takeouts and desperately unsatisfying sub sandwich meals. Sometime during a late night baby wrangling session, I caught Trisha Yearwood on the Food Network showing off her daddy’s Barbecue Chicken Recipe. The episode is sweet and outdoors and full of family and cooking, so basically, right up my alley. Instantly, I knew I had found my way back in the kitchen. Now, I admit to not really liking chicken very much. I consider it a necessary evil for both variety and health reasons. I also admit to not ever previously liking barbecued chicken. I love a steak or a burger on the grill, but chicken always seems to fall victim to that horrible burned flavor. Brine chicken in water with salt for six hours or overnight in fridge. This step is helpful, but if you need to speed it up you can use lukewarm water with double the salt. Do not skip entirely, however. Heat your grill. If you’re charcoal, you want your coals mostly white to avoid flareups- but make sure you have enough coals to last 50 min of grill time if required. If you have a gas grill, I’d start with a medium high heated grill then turn down to medium after you add the chicken. Turn on your fan/vent in your kitchen to make your barbecue sauce. Add vinegar, oil, Tabasco, pepper, cayenne, and 1/4 c. water to a small saucepan. Bring sauce to a boil while stirring, then take to your grill. Place chicken skin side up on grill, baste with your sauce. Check at 4-5 minutes for flare-ups. (In case of flare-ups, move chicken away from flame source to an outer edge of grill-plate then further reduce heat if a gas grill.) Baste 10 min later. Turn 5 minutes later and baste the other side. Turn 10 min later then baste again. Turn 10 min later, baste, check temp with meat thermometer. You are now at 40 minutes of cook time. Depending on the size of your chicken you may be finished or need 10 more minutes. 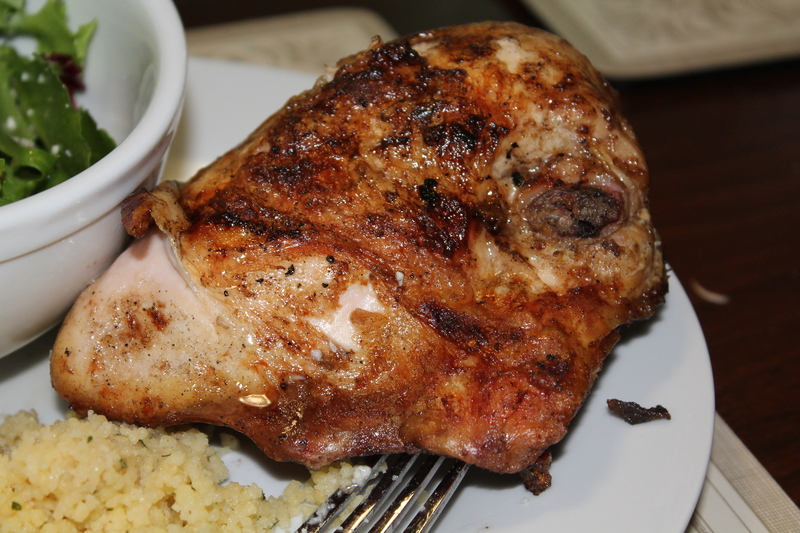 Chicken needs to reach an internal temp of at least 165, then remove from grill and let rest 5 minutes before serving. I serve with a light green salad and couscous or black beans. This week Central Market had the most beautiful local portabella mushroom caps on display. Though I’ve never been able to pull off the portabella burger (it’s a texture thing), I absolutely love the flavor of cooked portabellas. This super fast sauce created from roasted chicken pan juices and a little whiskey was the perfect way to fancy up a Thursday night chicken dinner. Trust me, it’s magic! When you’re roasting a chicken breast, skin and bones yield the very best flavor. It’s also very important to have your split breasts closer to room temperature before throwing in the hot oven. I drizzled and seasoned these about an hour before they went into the oven creating an optimally tender result. I’ve cooked them straight out of the fridge lots of times. Fear not, in a time crunch this won’t wreck your dinner. You simply won’t have *ideal* results. I’m led to wonder if this is what went wrong with my bone in ribeye at Wolfgang Puck’s CUT in Las Vegas – surely they couldn’t be aiming for mediocre? As a photography aside, I am dutifully working through a Publix (grocery store generic) paprika that I picked up this summer in Rosemary Beach, FL. I kind of hate it. The flavor is fine but the color is WAY TOO ORANGE! I’ll probably throw it out soon, but take note if you use a different brand your chicken will have a slightly different color. As my mother taught me, the purpose of paprika is for coloring – not for flavor. So if it’s not serving it’s purpose, I guess I should throw it out. Preheat your oven to 425. 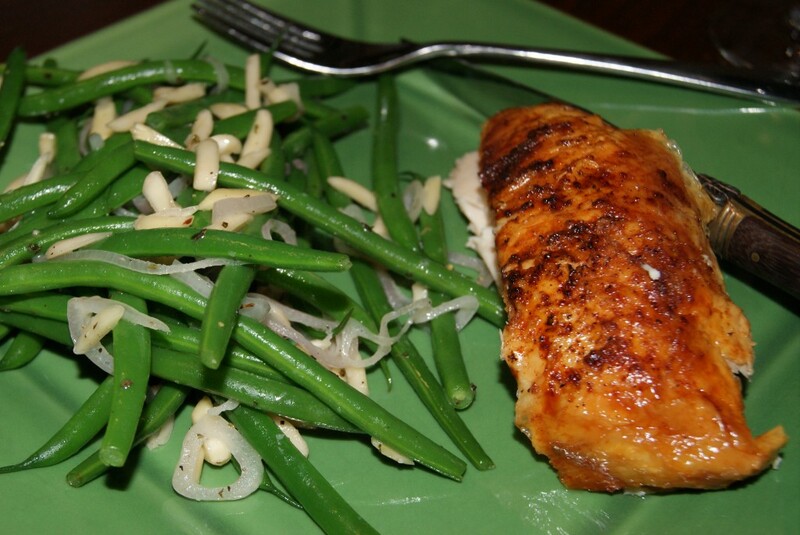 Place chicken breasts in a heavy bottomed saute pan. Drizzle chicken breasts with olive oil, then generously sprinkle with kosher salt, fresh ground pepper, and paprika. Roast chicken in oven for about 45 minutes to an hour – until they have an internal temperature of 165. Remove to a cutting board to rest. Warm a separate saute pan over medium high heat. Add butter after two minutes to melt, then add chopped portabella mushrooms. Sprinkle with kosher salt and fresh ground pepper, then brown thoroughly until mushroom water has been released and evaporated. Set aside. Spoon off any oil gathered in your pan drippings, then add hot water to pan over medium high heat. Use a wooden spatula to scrape up the brown bits, cook until volume is reduced by half. Add whiskey, then cornstarch and water mixture. Stir continuously with spatula. Stir until slightly thickened, then add mushrooms, stir and serve immediately. “Crunchy Green Beans with Almonds and Butter!” cries the smallest of my small ones. Not that he’s very small any more, as he’s approaching his fifth birthday. This is likely both my children’s very favorite vegetable, yet hell hath no fury if I run out of slivered almonds. The proper name for the tiny french green beans is haricots verts (ah-ree-ko v-eh-rr). That’s my personal pronunciation guide, so your mileage may vary. As other children hustled off to Camp Longhorn or Mystic or Birch Knoll, I begged to go to French camp at Concordia Language Villages in central Minnesota. Instead of soundly declaring me completely dorky, I prefer to think this an example of my endearingly bizarre nature. Unfortunately, I can offer no tips on Spanish pronunciation, my husband declared me useless there years ago. (I do think I’m improving with my Pimsler’s Spanish Audio Cds.) In retrospect, I also went to computer engineering camp before my junior year in high school. Only student not to get my 2 bit by 2 bit multiplier to work. Yep, I think I’ve confirmed myself totally dorky. Anyhow, these haricots verts are a super fast, healthy side, perfect for a weeknight. I hope you enjoy them as much as my children and I do. If you enjoy your shallots more caramelized – cook longer right after you add them. Bon appetit! Place a steamer basket or a colander over a pan of boiling water. Place haricots verts in steamer basket and cover with a lid. Steam for about 2 minutes then, taste to check tenderness. When bright green, softened, but still crunchy – remove from heat and plunge into an ice bath to stop cooking. This batch took approximately 2 minutes and 45 seconds. They need to be *vibrant* green! Drain haricots verts and pat dry with a towel. Heat a saute pan over medium heat for three minutes. Add butter, let melt, then add shallots. Cook two minute, then add haricots verts and almonds. Season with salt, pepper, and oregano. Cook two more minutes, then serve.